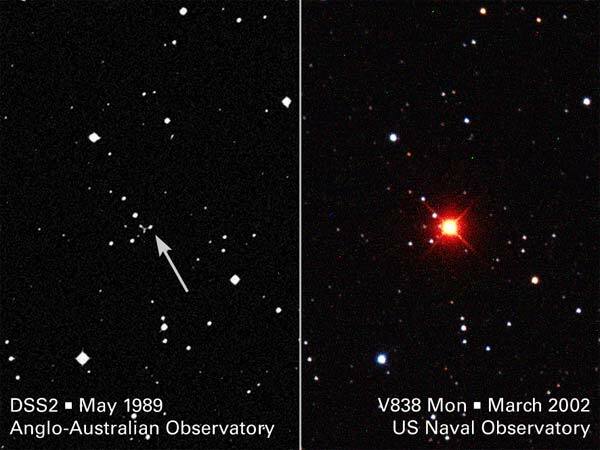 It is an apparent nova, which was first observed on January 6, 2002, and reported to astronomers in IAU circular 7785, January 10, 2002. It has since been the subject of numerous IAU Circulars, and several research papers (see below) have already been written. It is located in the constellation Monoceros, see the table that follows for precise coordinates of the nova object. It appears that the progenitor star began with an apparent visual magnitude of ~15.6, and brightened to a peak apparent magnitude of 6.6, which corresponds to an increase in brightness by a factor of 3815. The light curve & spectrum are not typical of any known class of object; it's not a nova, nor is it a "born again" helium flash star, such as Sakurai's Object (V4334 Sgr). It appears, therefore, to be unique, the only known member of whatever class of objects it represents. So, quite naturally, it is currently an object of intense scrutiny. The table above gives the astrometric coordinates for V838 Mon, from the only paper that actually includes a precise determination of the outburst coordinates. If I find any other reported coordinates, I will add them to the table. Goranskii, et al., were already observing the progenitor star, as part of another program, when it made its nova-like outburst. So they were able to determine the position quite precisely, and they also had good photometry for the progenitor before the outburst. They determine the position of V838 Mon by using 16 reference stars in the USNO A1.0 astrometric catalog, and their own CCD image of the area, with the K-585 array on the 1-meter Zeiss telescope. The measurement accuracy is �22 arcseconds. The coordinates of V838 Mon coincide with a blended object in the DSS & USNO archived images of the field. Their progenitor star coordinates, in table III, correspond to the brightest star in the blend. In , Munari, et al., determine, but do not report, a precise position for V838 Mon. They do report that V838 Mon corresponds to a known progenitor star, for which they give the positions listed in table III. In table II, the distances reported in the papers are all in parsecs. The distances given in light years are from me, for readers who may be less familiar with the parsec as a unit of distance (1 pc = 3.26 ly). The harmony that appears in the locations, in tables I & III, does not appear in table II. In [ 2], Munari, et al., derive the distance based on the observed expansion rate of 0.44�017 arcseconds per day, and an assumption that the circumstellar dust distribution was spherically symmetric. In [ 3], Goranskii, et al., determined that the progenitor was a hot blue star. Using the known extinction in the Galactic plane, they determined an estimated distance of 1200 pc. Their more precise distance, listed in the table, is based on an observed April 2002 nebular radius of 16.2�0 arcseconds, the implied rate of expansion since outburst on December 31, 2001, and the light echoes. In [ 9], Bond, et al., once again used light echoes, and their own HST images. But their determination appears to be much more detailed than the others. They assume a structure of nested spherical dust shells, and are able to follow the expanding light echoes from April 30 to October 28, 2002. From that geometry, they infer a minimum distance of 2000 pc, nearly double that determined by Goranskii, et al. But they have another trick that the others don't use. The light reflecting at a 90� angle should be highly polarized. They do measure ~50% polarization at one ring, and assuming a 90� angle, that gives the true size, and therefore the distance to the object. Because of their limited observations, they can only set a lower limit to the distance. So, the 6000 pc listed in table II is a minimum distance, it could be greater. Of course, the farther away V838 Mon is, the more impressive 9 magnitudes of brightening becomes. At 790 pc it's impressive, but at 6000 pc, it's spectacular. Bond, et al., assuming 6000 pc, derive an absolute visual magnitude Mv = -9.6, making the outburst temporarily the brightest star in the Milky Way (so they say, but it needs to be a bit further away still for that; Eta Carinae also has Mv = -9.6, and for Cyg OB2 #12, Mv = -10.6; if the "hot" model for the Pistol Star is correct, it has Mv = -10.4, see my Brightest Star in the Milky Way page). The very high distance from Bond, et al. in [ 9], rests entirely on their one polarization measure. If that holds up, then V838 Mon is much farther away than was previously thought. If not, there is still a problem with their more conservative lower limit of 2000 pc, nearly double the 1190 pc from Goranskii, et al., and 2� times the initial estimate of 790 pc. The true distance to V838 Mon remains elusive, and with it the true nature of the object. While the distance to V838 Mon might be in doubt, the location & nature of the star before it went into outburst, the progenitor star, seems to be much less controversial. Only Goranskii, et al., give the catalog name shown in table III, but the general agreement on location makes it clear enough that they are all talking about the same progenitor star. Gornaskii, et al., in  have the most insight to offer on the progenitor V838 Mon. They can follw the star in their photographic database, back to 1949, and in photometry, back to 1953. From 1949 to 1994, V838 Mon did not vary by more than �4 magnitudes, from a mean of 15.85, in the B band. In [ 2], Munari, et al., identify the star in the 2MASS catalog, with magnitudes J = 13.91, H = 13.48 and K = 13.35, obtained in 1997. Using their distance of 790 pc, they derive a blackbody temperature of 7300 K, size ~0.8 solar radii, and luminosity 1.6 solar, which is about 4.5 times less luminous than a F0 V main sequence star. But if that distance is really too small, then they underestimate the brightness, and it may in reality be even an overluminous F class star. There do not appear to be any recorded spectra of the pre-outburst star, and it was never identified as an line emission source, despite being in at least a few emission line sky survey fields. The blended source on the POSS & USNO plates implies that it was a binary system, as the blending appears to be star like objects, and not a nebula. At the moment, nobody knows why V838 Mon decided to go into an outburst. In , Soker & Tylenda suggest argue that a merging of two main sequence stars, one about 1.5 solar masses, and the other from 0.2-0.5 solar masses, would look just like V838 Mon, bright but low temperature. Aware of the distance problem, they scale their results over the full range of reported distance, and say that the model works out to ~10,000 pc. In , Bond, et al. argue that the merger hypothesis does not work, on the grounds that "evidently" V838 has done this before. But I don't know what their evidence is, and they don't say. Goranskii, et al. have an observational history of V838 Mon back to 1949 with no previous outbursts recorded. In , Retter, et al., argue that a model of an expanding red giant, swallowing up 3 relatively massive planets, is consistent with the observed behavior of V838 Mon. This model also has the advantage of being consistent with the results of extrasolar planet searches, which have revealed large numbers of systems with massive planets in close proximity to the parent stars, and some are multi-planet systems (see, for instance, the Extrasolar Planets Encyclopaedia, or the California & Carnegie Planet Search Project). But everyone seems to agree that classical novae, and helium flash objects, do not produce spectra that look like V838 Mon. So, for the time being, the question of what happened out there in the Galaxy, remains unanswered. Light Fantastic - A NASA news feature, March 2003 (see accompanying press release). V838 Mon = Peculiar variable in Mon - Images from The Astronomer Group. January 10, 2002. The first IAU Circular, reporting many observations dating from January 6. U. Munari, et al., Astronomy and Astrophysics 389(2): L51-L56, July 2002 (the first paper). V.P. Goranskii, et al., Astronomy Letters 28(10): 691-700, October 2002. J.P. Osiwala, et al., October 14, 2002; to appear in the proceedings of "Symbiotic stars probing stellar evolution", R.L.M. Corradi, J. Mikolajewska, T.J.Mahoney eds., 2002, ASP Conference Series, in press. S. Kimeswenger, et al., Monthly Notices of the Royal Astronomical Society 336(2): L43-L47, October 21, 2002. D.P.K. Banerjee & N.M. Ashok, Astronomy and Astrophysics 395(1): 161-167, November 2002. D. Kolev, et al., November 17, 2002, unrefereed; Collected papers, physics, 2002. Noam Soker & Romuald Tylenda, Astrophysical Journal 582(2): L105-L108, Jan 10, 2003. Howard E. Bond, et al., Nature 422(6930): 405-408, March 27, 2003. John P. Wisniewski, et al., Astrophysical Journal 588(1): 486-493, May 1, 2003. Lisa A. Crause, et al., Monthly Notices of the Royal Astronomical Society 341(3): 785-791, May 21, 2003. V838 Mon: an L supergiant? A. Evans, et al., Monthly Notices of the Royal Astronomical Society 343(3): 1054-1056, August 11, 2003. A. Retter & A. Marom, Monthly Notices of the Royal Astronomical Society 345(2): L25-L28, October 21, 2003. John P. Wisniewski, Karen S. Bjorkman & Antonio M. Magalhaes, Astrophysical Journal 598(1): L43-L46, November 20, 2003. M.T. Rushton, et al., Astronomy and Astrophysics 412(3): 767-769, December 2003. R. Tylenda, Astronomy and Astrophysics 414(1): 223-233, January 2004. S. Desidera, et al., Astronomy and Astrophysics 414(2): 591-600, February 2004.